Minnesota Conservatives: Why Can't Minnesota Republicans Message? I've been meaning to write a blog post on this evergreen topic for some time. What causes me to do so now is my accidental discovery last night that some house republican communications staffers (and their equivalent) stopped following me on Twitter. I don't use a program that tells me how many people have unfollowed me or how many have decided to follow so this bit of delightful news was completely an accident. Some of them had unfollowed a rather well known friend of mine which bothered him. We have both noted on Twitter, pointedly at times, the messaging failures of the republican house & senate caucus. I'm serenely indifferent to who does or does not follow me on Twitter in the same manner I'm unlikely to care if people take umbrage at what or how I blog. All within reason, of course: your true friends tell you what you may not want to hear. They don't grow many people like that in Minnesota for some reason, to the perpetual astonishment of those of us who move here from other places. My previous blog post brought that truth home again to me with spectacular clarity. At any rate, cutting off those who critique you probably isn't the best route to improving your job performance but of course that presupposes one wants to improve rather than tread water. The evidence is demonstrably thin in that regard when it comes to republican messaging. As I quipped on Twitter not too long ago: to point out our abject messaging failure is to become the problem. It's as though getting a job on the basis of friendship should not come with the obligation of being competent for the job so given. Friendship should be no bar but being able to get the job done--and being held accountable when it is not--should count just as much at a minimum. The problem with house communication staffers isn't just (or even mostly!) with them: it's with their bosses. What should this group of young adults do regarding messaging when they can't get an accurate, ongoing read from them? It's too easy--and manifestly unfair--to focus only on minority leader Rep. Kurt Daudt. There are others in leadership and we see nothing from them concerning consistent, strong messaging. 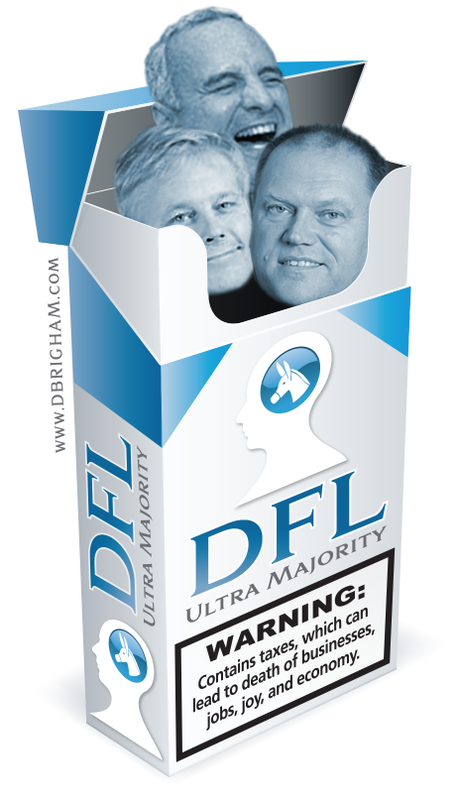 Do they think the DFL simply sat on their hands while they were in the minority? The opposite was the case. Where's the rest of house leadership? You don't deserve a future or a position further up the greasy pole by doing nothing and acting virtuous about it. Disheartening as it may be to the rest of leadership (including the failed, disgraced leadership from last session), people are watching. Is it going too far to suggest they are happy to see Daudt up front and struggling in difficult times while doing little or nothing to support him? No. Indeed, that seems to be the very case. Maybe our messaging problem is cultural, a republican political culture poisoned by the unspeakable mediocrity of Tim Pawlenty such that every republican south of 40 thinks appeasement, pandering and "what's in it for me" is the way to stay in place if not get ahead. If that's all you know, that's all you know. Many want to be the next Brian McClung, as preposterous as that may sound. Unfortunately, this amounts to a unilateral surrender on our part against a very well messaged, well funded machine on the other side, replete with union strength which tends to repel me but also commands my respect for sheer effectiveness. If I had to call myself out on the matter, I'd confess to liking conservative unions (they used to exist) as opposed to liberal ones; hence the problem isn't with unions per se. Perversely, in the absence of decent, effective messaging we get nightmares like Rep. Glen Gruenhagen shooting off their deeply ignorant mouths and becoming for a news cycle or two the face of Minnesota republicans. I can't fault entirely the younger set for wanting to be somewhat cautious in the face of such embarrassments. All this does, of course, is underscore the lack of leadership during these dark days of one party, paleo-liberal rule. The Bellevue Hospital that is the senate, of course, makes the house leadership, caucus & staff look like Madison Avenue on the Mississippi. Sen. David Hann is too busy thinking about running for governor to bother to lead or formulate a consistent message. His right hand man possesses a junior title to the head of senate communications but she seems consistently outflanked by him and by his closeness to the man in erstatz charge. This is a genuine pity because she actually does know how to message. Just our luck the old boys club freezes out yet another talented republican woman. Sen. Dave Thompson is also running for governor so there is no natural interest in the overall welfare of the caucus and its messaging. Apparently being deposed in the Brodkorb lawsuit gives him no pause. That, of course, would take thoughtfulness. Sen. Dave Senjem, having made a hash of the Brodkorb situation and his federal lawsuit, is content to wander the halls being photographed sharpening his pencil with a pocket knife. This isn't entirely true: like Annette! Meeks, he seeks to force taxpayers to fund yet another development boondoggle, this time in Rochester with the destination medical center or whatever horrid moniker the consultants came up with. One assumes she's getting paid now while Senjem will be in some form or another further down the line. Throw in those supporting the corrosive National Popular Vote and we have a party devoid of principle and integrity. Gov. Dayton is falling in popularity but you wouldn't know it from his supporters in the media. It took Ben Golnik to ferret out the polling data from the middle of yet another disengenuous Star Tribune story. What did republicans do with this important information? Not much. The next time someone criticizes political consultants to my face I'm going to hand them a class picture of the republican caucus in both chambers. How do republicans start messaging effectively? Thinking is a start and hopefully not too high a hurdle. What do we stand for? Admittedly, after our time in the majority it's not as easy to articulate as it once was. But we can get back to a few solid principles that need not be trotted out here. How about contrast? The DFL is overreaching in ways that disturbs many on the other side with whom I speak in confidence. It simply isn't difficult to craft a sustained message that this isn't what Minnesota voters were asking for last November. Gov. Dayton got 43% of the vote and many 2012 legislative races were quite close. Couple those facts with the Governor being under-water in the polls and it takes a particularly incompetent group of politicians, staff, activists and hangers-on not to come up with messaging that works. Timidity, though, may be the biggest obstacle. Even if a good message is created, it has to be used. The image above is a case in point. I first saw something like it on Twitter from a UK Conservative party politician I follow. It had different faces, naturally, and text but the idea was excellent. I brought it to the attention of Derek Brigham & Nancy Laroche who worked their magic and came up with what you see. Succinct. Accurate. Immediately effective. Naturally the senate and house caucuses did nothing with it. It appeared on the True North blog, was tweeted a few times but never really was utilized. Too mean, too aggressive we were told. The Pawlenty effect, shall we say. Obviously one graphic does not make for a messaging campaign. Effective messaging requires attentiveness to the other side and its missteps, taking immediate advantage of them in order to discredit them and then pivoting in an advantageous way to one or more of our strengths. Rep. Sarah Anderson gave me the metaphor of those inside the fishbowl of the legislature (members & staff) and those outside of it. It's a useful metaphor because the mental image is so immediately apparent. Those of us outside the fishbowl want those on the inside to succeed, do well, achieve. We believe our ideas and policy proscriptions are not only right but good for Minnesota. We are desperate to take back the majority in the house so as to act as a brake to the stale, outdated, failed, nay ruinous liberal ideas being foisted upon us. Those inside the fishbowl tend to think too highly of themselves and resent it when their glaring failures are pointed out. If an idea doesn't come from within the fishbowl, it will die a lonely death like the graphic above. I have no doubt that those of us on the outside fail at times to appreciate the unique environment in which they work; I say this with all genuine goodwill. I will also hazard a guess that we outsiders cut them more slack and understanding than they do with us. In fact, I've been regaled with tales of what they think and say about us. Really, those with such thin skins & insecure psyches ought not to be anywhere near politics. Fishbowls are transparent, however. Those inside appear oblivious to the fact that we see what they do and don't do. This seems to be one of those hard truths those guppies can't quite accept. Here's another: it's you who are accountable to us, not the other way around. A survey of Minnesota voters showed 75% overall support for a national popular vote for President. Support was 84% among Democrats, 69% among Republicans, and 68% among others. By age, support was 74% among 18-29 year olds, 73% among 30-45 year olds, 77% among 46-65 year olds, and 75% for those older than 65. By gender, support was 83% among women and 67% among men. Support for a national popular vote is strong among Republicans, Democrats, and Independent voters, as well as every demographic group in virtually every state surveyed in recent polls. Jason Cabel Roe, a lifelong conservative activist and professional political consultant wrote in National Popular Vote is Good for Republicans: "I strongly support National Popular Vote. It is good for Republicans, it is good for conservatives . . . , and it is good for America. National Popular Vote is not a grand conspiracy hatched by the Left to manipulate the election outcome. National Popular Vote is not a change that can be easily explained, nor the ramifications thought through in sound bites. It takes a keen political mind to understand just how much it can help . . . Republicans. . . . Opponents either have a knee-jerk reaction to the idea or don’t fully understand it. . . . We believe that the more exposure and discussion the reform has the more support that will build for it." Former Tennessee U.S. Senator and 2008 presidential candidate Fred Thompson (R), former Illinois Governor Jim Edgar (R), and former U.S. Representative Tom Tancredo (R-CO) are co-champions of National Popular Vote. National Popular Vote's National Advisory Board includes former Senators Jake Garn (R–UT), and David Durenberger (R–MN) and former congressman John Buchanan (R–AL). Rich Bolen, a Constitutional scholar, attorney at law, and Republican Party Chairman for Lexington County, South Carolina, wrote:"A Conservative Case for National Popular Vote: Why I support a state-based plan to reform the Electoral College." James Brulte served as Republican Leader of the California State Assembly from 1992 to 1996, California State Senator from 1996 to 2004, and Senate Republican leader from 2000 to 2004. Dean Murray is a member of the New York State Assembly. He was a Tea Party organizer before being elected to the Assembly as a Republican, Conservative Party member in February 2010. He was described by Fox News as the first Tea Party candidate elected to office in the United States.